Let me explain. 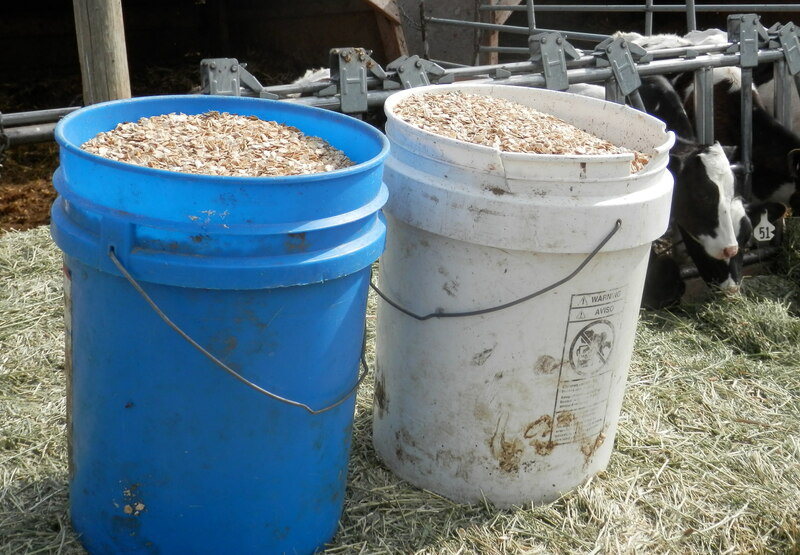 At the dairy, I feed buckets of grain to pens of growing calves. Two of the pens of youngest calves get their grain spiked with special stuff (protein supplement). To keep track of which buckets are spiked, I always use the blue bucket and the “broken” white bucket. Let the blue bucket represent the “Blood of Christ” (blood’s blue ya know from certain perspectives) and the white bucket “me” the broken one. I might be operating under some OCD tendencies, but repetition is the name of the game in dairy land. So, I let it release the power of “remembering.” Remember and notice the beautiful initiator, my Christ. Remember the cost, His very life, His precious blood. Remember my brokenness healed. Remember my sins forgiven. Each day, I am filled again to be poured out. I like that. Joy and gratitude slowly replace my demandingness, manipulative sense of duty and simmering anger in a deeply meaningful transformation. I shall yet praise Him! Have yet a strain for thee!